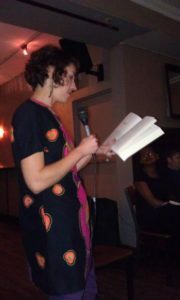 Read poems at Cornelia Street Cafe’s Bennington Writers Boston Night, hosted by V. Hansmann. With Alden Jones, Ken Harvey, and Steven LaFond. November 25, 2013. Greenwich Village – NYC. Read poems about glaciers at Rooms Down the Hallway. With Chip Cheek and Celeste Ng. November 21, 2013. Jamaica Plain – MA.